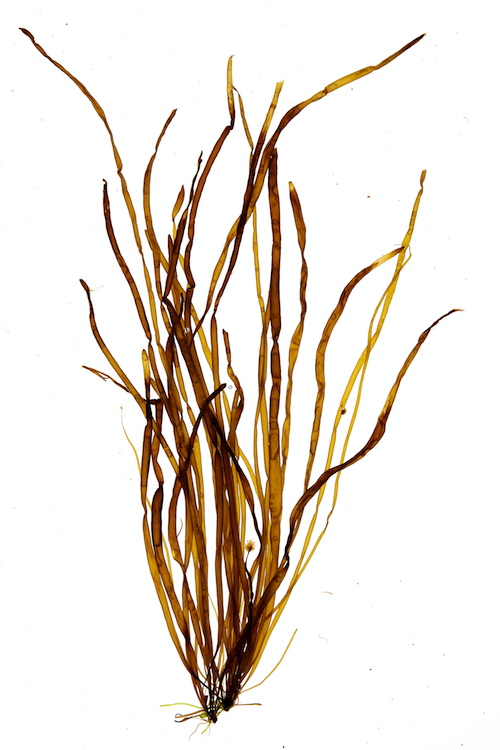 Description: Plants cylindrical, yellowish-brown or dark brown, to 400 mm long. Unbranched, 3-10 mm wide, narrowing at both ends, attached by a short stalk. Hollow and often with irregular constrictions. 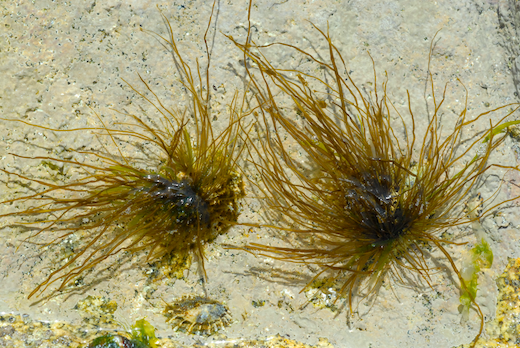 Habitat: most common in upper-shore pools growing on limpets; on rock on wave-exposed shores, where another, more rare entity, Scytosiphon dotyi occurs. Key characteristics: Hollow and often irregularly constricted; but beware narrower plants with no or very few constrictions (below). Site © M.D. Guiry 2000 - 2019. Important copyright notice: all text, design and photographs on this site are copyrighted by M.D. Guiry unless otherwise stated and all rights are strictly reserved. Click here for copyright information and contact. Website design: 249 Design Studio. Site maintained by M.D. Guiry (michael.guiry@nuigalway.ie). There have been 8736598 page loads since 1 January 2014 on 25 April 2019.